Babies may not be able to tell us how they are feeling, but that doesn’t mean the range of emotions they feel is any less varied than adults. “Babies have the capacity to experience peaks of joy, excitement, and elation,” Clair Rees, executive director of the charity Parent Infant Partnership (PIP) told HuffPost UK. “They also feel fear, grief, sadness, hopelessness, and anger - emotions that many adults understandably find it hard to believe, or accept, that very young children can experience. “But babies have an emotional world, which develops in the context of their earliest relationships starting in the earliest months of life, well before they can use words to express themselves. That is why PIP joined forces with many parenting and children’s organizations, (including Public Health England and the Royal College of Midwives), to launch Infant Mental Health Awareness Week, which is now in its second year. “As a society it is pivotal that we nurture our youngest citizens with a mindful environment for their physical and mental needs,” said Rees. Tessa Baradon, leading child psychotherapist and parent-infant project manager at the Anna Freud Centre, told HuffPost UK that the first 1001 days of a baby’s life is a pivotal time for their mental health. “What happens in earliest childhood can matter for a lifetime,” she said. “From the prenatal period (before and soon after birth ) through the first years the brain undergoes its most rapid development, and the environment in which the baby develops provides powerful experiences which form the foundation of his/her brain architecture, for better or for worse. “Relationships, learning, behavior and health are all built on that foundation. “Repeated, predictable positive experiences in the baby’s relationships with his parents stimulate the development of pathways in the brain that support the baby’s capacity to thrive and adapt. So what can parents do to help build babies’ minds’? “Recent research proves that how a parent behaves around their baby in the first 1001 days of life has a direct impact on how their baby’s brain develops,” said Rees. 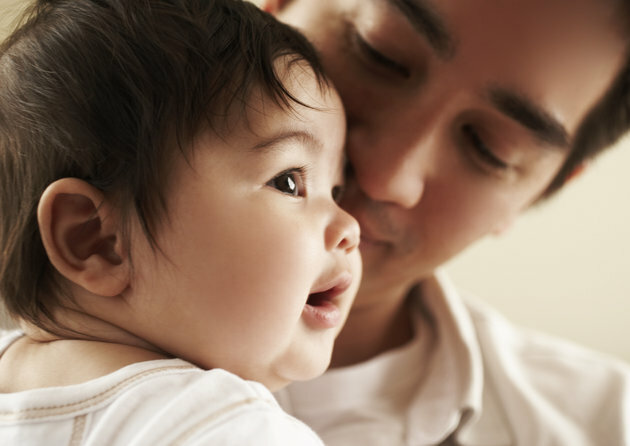 “When a baby has the opportunity to form a secure bond with their parent or caregiver, this can support their potential and ability to form healthy relationships throughout life. Baradon added: “Your baby is constantly communicating with you through his/her behavior. “For example, when turning to you or away from you, looking into your eyes, smiling or fretting or crying, he is telling you – in his ‘language’ what he is feeling and what he needs from you at that moment. “Try to understand what he is saying and to respond as soon as possible to that communication. “You don’t have to get it right immediately for your baby to feel secure in the fact that you are with him emotionally and will help him when he needs you. “One of the most important building blocks in healthy development is the ‘back and forth’/’serve and return’ experience. Little babies reach out through babbling, gestures and facial expressions, and adults usually spontaneously respond with the same kind of vocalizing and expressivity. Baradon also explained that it’s important for parents to look after their own mental wellbeing. “Babies needs stable, safe environments, in which their parents can focus on them,” she explained. “If the parent is in emotional turmoil – e.g. marital conflict or depression – these can absorb the parent’s attention and emotional energy, and take away from their capacity to respond to their baby. Sleep is a major concern for most parents of newborns, which can impact on both the child’s and the parents’ mental health. “The issue of sleep is likely to preoccupy many parents in the first 1001 days, it is after all a basic need and sleep deprivation can impact negatively on parental mental health. “It is important that parents rest when their youngsters rest and that they allow themselves time to get into a routine that suits their parenting style. The children’s charity Barnardo’s has created a free “baby brain workout” made up of 15 activities that encourage healthy mental and emotional development. The activities are based on ‘Five to Thrive’ principles of - talk, play, relax, cuddle, and respond - which have been shown to help children develop a healthy brain. “Babies’ minds are built through their experiences so playing with them is not just a lot of fun, it’s also really good for their brain development and wellbeing,” explained Javed Khan, Barnado’s chief executive. Read a book to your baby or toddler and give your child a chance to join in. If your child is older, ask them to turn the pages, predict what is happening next or get them to act out the story with their toys. Get a bucket or bowl and put warm water in it. Sit or hold your baby safely near it and support them to play with the water. Splash each other gently or run water over their arms or toes. Respond to your baby’s facial expressions and copy them. Tickle their toes, palms or any other areas they like and get them to tickle you too. You can also try out ‘high fives’, ‘pat-a-cake’, ‘this little piggy’ or any other childhood games that includes contact. Respond to your child by copying their facial expressions and give them time to respond. Playing these games is great for your child and can be amusing and amazing for you too. The organizations behind the first Infant Mental Health Awareness Week in 2016 came together to call for more investment in looking after infants’ mental health in the first 1001 days. They highlighted key recommendations of the cross-party ‘1001 Critical Days Manifesto’, in Westminster on Thursday 9 June 2016. “The ‘1001 Critical Days Manifesto’ calls for increased support for vulnerable families where mental health, domestic violence or substance misuse may be present around children’s experience of early childhood development,” explained Rees.